Research into electronic cigarettes will doubtless lead to advertisements for and discussions about the Riva. It’s one of the “fat-bat” models that solved the problem that plagues the typical mini electronic cigarette – short battery life. 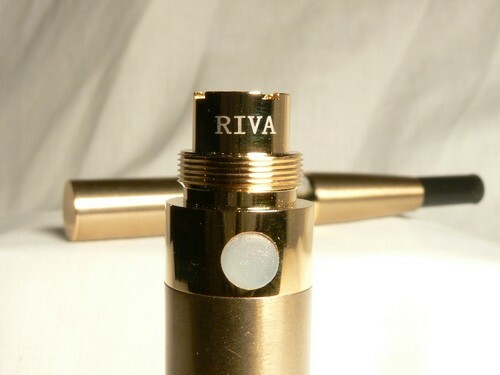 Popularity of the Riva and the eGo it is modeled after has grown exponentially in the past year and they deserve a look from anyone interested in a personal vaporizer (PV). I recently had the pleasure of receiving an EM Riva kit from EVcigarettes and I am enjoying it immensely. 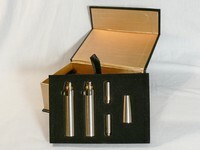 The kit comes attractively packaged in a black and gold flip-top box. Two batteries, two atomizers and a matching cone are the first items to great your eye as you open the box. The charger and ten empty cartridges are located on the second layer. In addition to the user manual, a lengthy list of frequently asked questions was included in the shipment that covers many of the potential issues that a new user may encounter. The finish on the Titanium EM Riva is quite attractive. The body and cone have a brushed gold finish that has a metallic sparkle in direct sunlight. The bright gold band of the Riva blends nicely between the battery and matching titanium cone. Appearance is a big part of the appeal of the Riva and this finish looks great on it. The battery on the Riva is rated at 750mAh, meaning that it will last the typical vaper all day and then some. Kits are also available with 1100mAh batteries which would provide nearly twice the vaping time between charges. The 1100mAh batteries are slightly longer than the 71mm of the 750mAh. During normal use, the 750mAH battery performed as expected and lasted more than a day between charges. Testing the Riva battery under load indicates that it performs better than the eGo batteries. Loaded with a regular atomizer, the Riva produced a level 3.7v, compared to the eGo at around 3.2v. Loaded with an LR atty, the Riva voltage dropped off a little but in a number of tests still stayed in the 3.3v to 3.6v range. Many vapers do feel that a little extra voltage improves the vaping experience. The included dual 110/USB fast charger will recharge the batteries in a couple of hours. 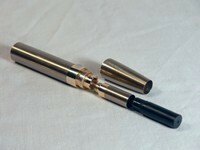 The kit from EVcigarettes included two atomizers – one regular and one low resistance (LR). The atomizers arrived with little to no primer fluid in them and tasted great with the first drops of liquid. 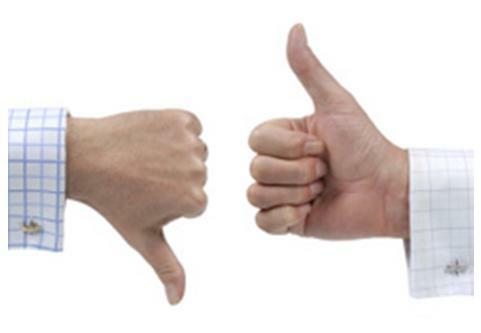 Tests show the resistance to be 2.0 ohm and 1.5 ohm respectively. Low resistance provides a warmer vape at a slight cost in flavor production. It is nice to see both atomizer versions in a starter kit, as it gives the new user the option of comparing regular and low resistance right out of the box without ordering anything additional. The LR atomizer on the 3.3V battery has become a favorite combination for many vapers, which again makes EVcigarettes inclusion of both regular and LR atomizers a nice touch. Both of these atomizers perform very well and deliver rich vapor. The Riva kit comes with 10 blank cartridges rather than prefilled. The taste of typical prefilled cartridges is usually nothing special and the selection of flavors limited, so starting off by filling their own carts will likely give new users an even better first experience. EVcigarettes makes this easy by including two 10ml bottles of juice with the kit purchase. The Riva web page on their site presents individual drop down boxes for each liquid choice, making the process as simple as possible for new users. The liquids are Dekang brand in a 50/50 PG/VG blend, also a good place to start. 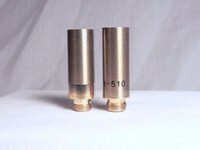 The cartridges are typical round tip 510 type, so filling is a simple process. Just remove the cover to expose the fiber filling material and then remove that as well. Tilt the dropper bottle above the cart and fill to within about a ¼ inch of the top. Slip the filling back into the cart (a pair of tweezers will simplify this part) and add a drop or two to the filling to moisten it if necessary. The filler should be clearly wet, but remove any excess liquid pooling on top of it by dabbing with a paper towel. That’s all there is to filling and the cartridge can now be inserted into the atomizer on the Riva. If this is the first time it has been used, dripping a few drops of liquid onto the atomizer before inserting the cart will get things started a little quicker. EVcigarettes also adds value by including a Delrin drip tip with every Riva kit purchase. With the drip tip attached in place of a cartridge, it is possible to drip a few drops directly on the atomizer for 5 or 6 inhales worth of vapor. 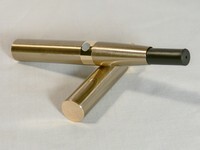 The Riva/eGo style of electronic cigarette has proven to be a favorite of many vapers, beginners and experienced users alike. Style and functionality at a reasonable price are the keys to its success and the Titanium Riva is a luxurious looking example of the model. EVcigarettes has put together a great kit and their well designed web site and comprehensive documentation make this kit a good value. Enter the coupon code vapingguides at checkout to get 15% off your order and make this an even better deal!